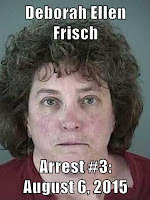 Eugene (Aug 7)--Oregon Criminal Deborah Frisch, arrested for repeated violations of her probation, may not have to wait long for adjudication of her latest criminal behavior. Debbie Frisch received a 105-day suspended jail sentence on June 10th, after pleading guilty/no-contest to charges of making a false criminal report and violation of probation. After the plea-deal, Miss Debbie quickly returned to her stalking, harassing, and threatening behavior--both online and in real life, thus leading to Thursday's arrest. hearing in 2010)--including a ban on Internet use. It is unknown whether the Lane County District Attorney's office will pursue such a sentence. 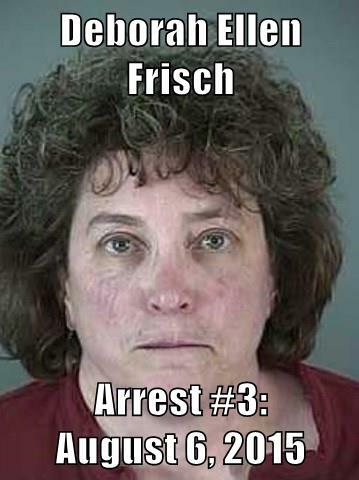 Also unknown is whether Frisch's second probation-violation conviction will carry additional jail time.